Stainless steel plates are all sanitary stainless steel plates. Ensure the finish of chamber surfaces, and then ensure the asepsis requirement. Shelves has high intensity and its maximum valve reaches to 0.3Mpa in the pressure test which can be able to bear the long term usage. Shelves are processed by machining which can ensure the demanding level. Chamber, shelves, flexible hoses are all carried out the leak test by helium mass spectrometer. Condenser and coiled pipe are all carried out the leak test by helium mass spectrometer. Adopting the BITZER compressor makes the performance be more stable and relibale. Adopt the environmental protection type refrigerant which accords with the Montreal Convention. The refrigeration system has all kinds of protection functions and interlock protection. The automatic adjustment function of pressure under the condition of low load in the late of freeze drying period. The poly-protection function of oil pressure in the refrigeration system. The efficient pump head valve and vacuum pump start or close simultaneously. These can prevent the vacuum pump oil from spreading in reverse effectively. All the pipelines use the automatic welding which will ensure the finish of inner and outer surface. Electric heating is controled by PID which can use the heating energy most effectively. It accords with European standard FDA. There are electronic signatures and multiple passwords. Switch the type between manual and automatic at any point randomly. 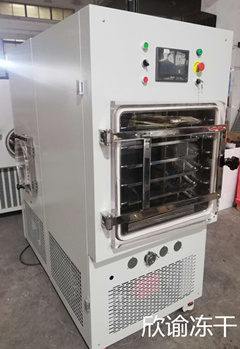 The operation can be in the sterilizing room, machine room and control room for freeze drying. And they have the interlock functions which prevent faulty operation. There is a hydraulic emergency button in sterilizing room. It can stop the shelves forcibly in an emergency. There are working state of all kinds of parts and valves and parameter display of temperature and vacuum degree on the friendly human machine interface. It can set countless technologies curves for freeze drying in the “recipe management”. 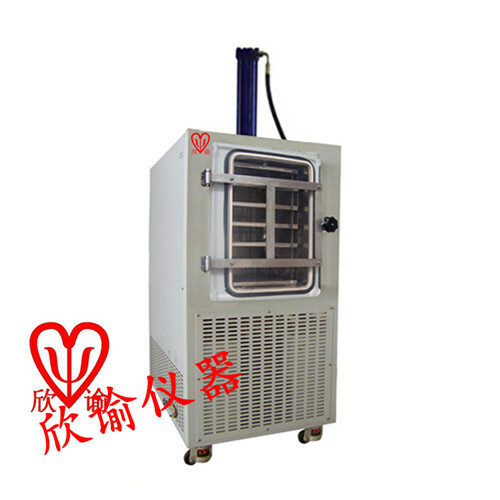 These personalized functions such as getting in chamber at low temperature, refreezing, testing of pressure rise, selective aerification control between aeration valve and butterfly valve, automatic degassing and stoppering, and getting out chamber at low temperature and so on can be achieved in the “recipe management”. There is a function for displaying by stages in the automatic process of“freeze drying ”, and it can skip randomly. The recipe can be adjusted momentarily in the “freeze drying ”process. There is a function for displaying various trouble points on the operation interface. There is a function for recording both data and curves which can be used or printed momentarily according to the batch number. It can save countless data and curves records. Each curve of vacuum degree and temperature is displayed in multicolor, and it can be set for “displayed”or“hidden”randomly. After “freeze drying”it can print the original records together such as “technology formula”, “data curve”, “history file”, “operation record”, “alarm reporting” and so on. These can be saved as the detailed batch records of a batch of product. It can increase corresponding software function according to actual requirements of customer. Software system accords with FDA 21CFR PART II. There are electronic signatures and three stage authorization managements. The curve charts can not be modified. UPS(uninterrupted power supply) will supply power to PLC and various sensors in 20 minutes after emergency power shut off.